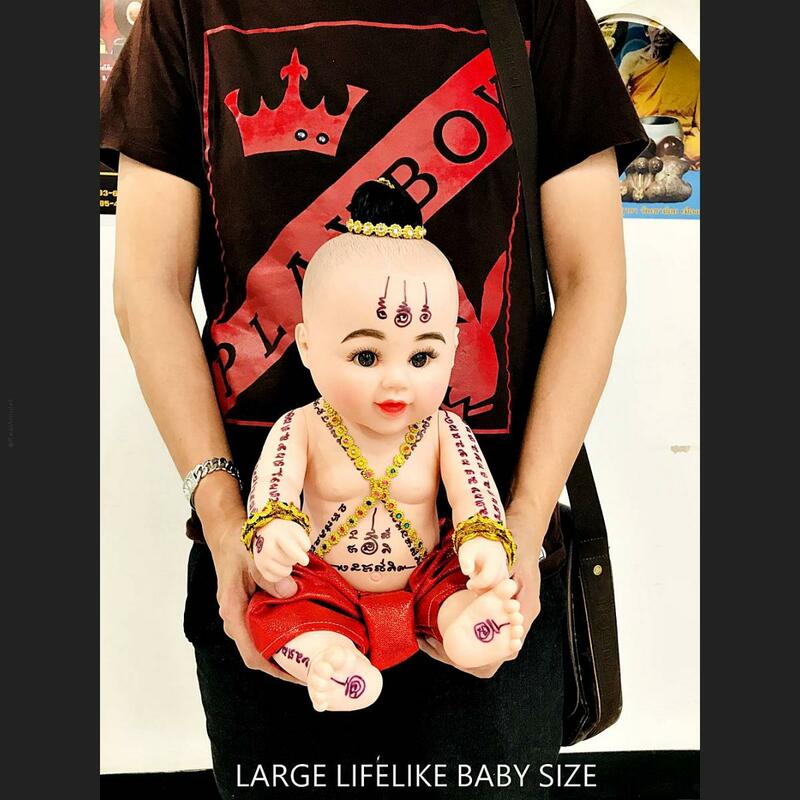 Item 名稱: LARGE LIFELIKE BABY BOY LUKTHEP SPIRIT DOLL THAI AMULET GUMAN CATCH MONEY FAST RICHLY KUBA KOMPENG. LUKTHEP NOP-PA-KOW, THE ANGEL, SON OF DEITY, CUTE GOLDEN BABY BOY SPIRIT. LONG HAIR CUTE FACE , FULLY BODY WRITEN ALPHABET YHAN, GOOD TO CATCH WEALTH TO OWNER. 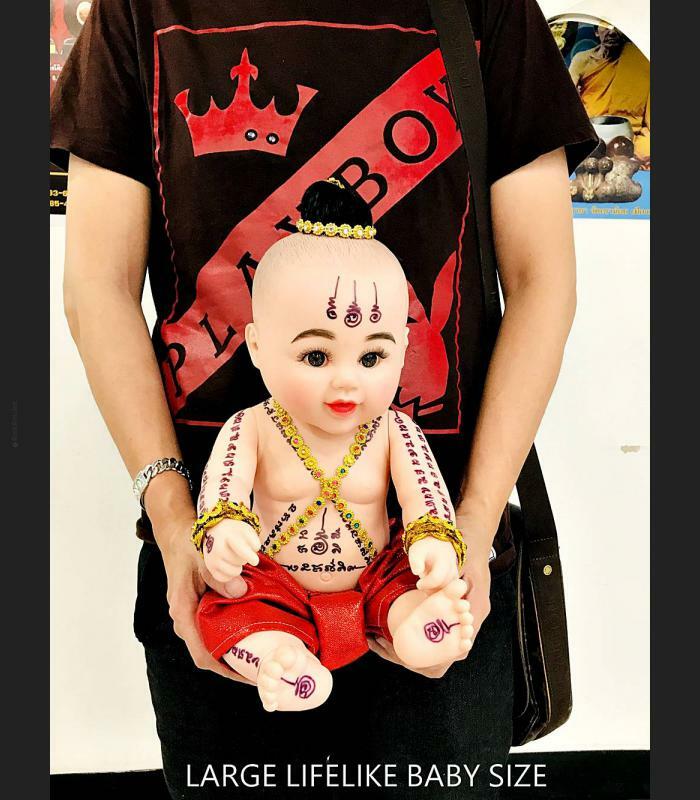 LukThep or Child Angels, Most are plastic Doll, life-like baby dolls that are believed to be possessed by spirits that bring about good luck and future prosperity. Luk Thep are treated like any other baby or child, they are fed, dressed and cradled. The lifelike manufactured dolls have become a large and (somewhat) normal part of everyday life for Thai people as well as a worldwide sensation that international media outlets latched on to. the dolls to have superpowers. Shortly after the statement Buddhist monks and fortune tellers held rituals to place lucky spirits into the plastic dolls. Thai celebrities were quick to jump on the bandwagon and were seen carrying Luk Thep where ever there went. Taking the dolls to swanky restaurants and nail spas and even demanding separate plane seats for them. Thai Smile a national low-cost carrier of Thai Airways even allowed parents or guardians of the Luk Thep to purchase seats for their Child Angels, for them to be offered onboard meals and briefed flight attendants to treat them like any other child passenger. There are a few different theories on the origins of Luk Thep, with some making the assumption that Luk Thep are updated versions of Kuman Thong. Kuman Thong were fetuses which had passed away before being born which were kept and believed to carry the spirit of the dead child. Others believe that the Luk Thep tradition is tied to Thailand’s low fertility rate, as middle-aged Thai women are most often the ones toting these sacred dolls about. Another common belief is that due to the challenging economic climate in Thailand in 2016 when the tradition was born, Thailand’s citizens needed something to cling on to (literally). However, the consensus sways more towards the Luk Thep culture being connected to the fusion of Thailand’s strong Buddhist belief and influences from Hinduism, animism and object worshipping traditions. "I am believe if they take care of the luk thep doll, luck will come to them." There are various degrees to an owner's participation, some will simply keep the doll in their business and not take it home, whereas others go as far as feeding and changing their dolls, hiring a babysitter, and setting up group playdates, according to Mustard. Certain restaurants in Thailand have even offered a special luk thep menu, with meals for the dolls.